Deposed Honduran President Jose Manuel Zelaya took refuge at the Brazilian embassy in Honduras on September 21. 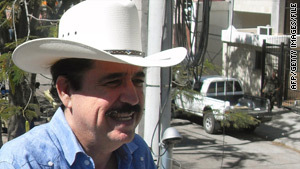 (CNN) -- A Mexican petition that would have granted deposed Honduran President Jose Manuel Zelaya safe conduct out of the country was rejected by Honduran authorities because it did not meet legal standards, Honduran Government Minister Oscar Raul Matute told CNN en Español. Zelaya has been holed up in the Brazilian embassy in the Honduran capital of Tegucigalpa since September 21. In the letter, obtained by CNN, Mexico asks the de facto Honduran government to guarantee Zelaya's safety from the embassy to the airport, where a Mexican Gulfstream III jet would fly his family to Mexico. The Mexican embassy in Honduras "has the honor of informing that the government of the United Mexican States has decided to receive on its territory" Zelaya, his wife, two children and one of his advisers, the letter states. "The embassy petitions the ministry (of foreign relations) to provide safe conduct so that the above Honduran nationals may leave Honduran territory safely, with respect of their persons and without being detained or otherwise harassed," the letter states. Matute said the letter did not meet the necessary standards because it made no mention of under what legal status Mexico would accept Zelaya and his family. The Honduran foreign ministry said it would consider future petitions from Mexico or any other countries, as long as they met the accepted legal standards for a request of political asylum. The letter submitted by Mexico makes no mention of granting Zelaya political asylum or any other legal status. The omission may not be accidental. In an interview with CNN en Español, Zelaya said he is still the legitimate president of Honduras, and as such, would not ask for, or accept political asylum. If he leaves Honduras for another country, it would have to be as a "guest," Zelaya said. Zelaya did not say whether he was negotiating to leave. Rasel Tome, the Zelaya adviser who was named in the letter, said negotiators for Zelaya had spoken with presidents in several Latin American and Caribbean countries Wednesday, including Mexico. The goal of the conversations was to "find a way out of the crisis," Tome said. In a statement, Mexico's foreign ministry said its request was made with the support of allies and political actors in Honduras. "Our country seeks to contribute to rapprochement in Honduras, taking a positive step towards resolving the crisis in that country through dialogue and negotiation," the statement said. After spending months in exile, Zelaya snuck back into Honduras in September, and has not left the Brazilian embassy. His return was an effort to restart talks to negotiate his return as president. The latest setback for the ousted president was a congressional vote, mandated by the agreement, on whether to reinstate Zelaya. Congress voted overwhelmingly against reinstatement. The same body had voted to install congressional leader Roberto Micheletti as interim president. Zelaya's supporters argued that the coup was an illegal act that only restitution could heal. Congress sought opinions from the nation's Supreme Court and other bodies before holding the vote. The court ruled that Zelaya cannot return to office without facing trial on charges that he acted unconstitutionally when he tried to hold a vote that could have led to the removal of presidential term limits. The Supreme Court ruled before the coup that the vote was illegal and Congress had forbidden it. The coup came on the day the term-limits vote was to have been held. Micheletti and his supporters have insisted that Zelaya's removal was a constitutional transfer of power, not a coup. But the United Nations, the Organization of American States, the European Union and most nations -- including the United States -- condemned the coup and demanded that Zelaya be reinstated immediately.